Little Stockholm is a Swedish district in Springfield. 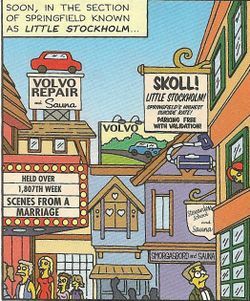 The district has a cinema, a workshop for Volvo Cars with a sauna, a restaurant called Smorgasboard with Sauna and a school called Stewardess School with a Sauna. The district also have a grocery store that sells Swedish foods. Waylon Smithers was once sent to the district to buy food for Mr. Burns. While there, he met a woman who saw similarities between him and the King of Sweden. Modified on July 26, 2017, at 16:59.